This is getting to be an edge-of-seat rolling drama, a truth-stranger-than-fiction boxset, hopefully not with an eight season run. Psycho-babble first. Why does Trump go weak at the knees over dictators and gangster leaders? Simple answer – his father Fred Trump, born 11 October 1905, NY. 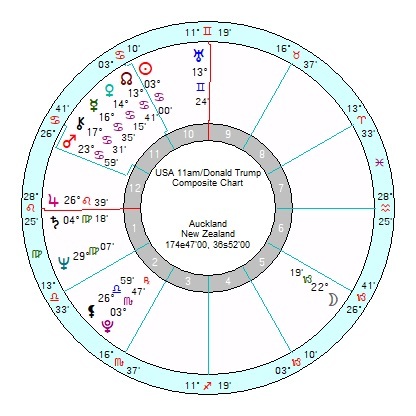 He was a Sun Libra like Putin with his Pluto in Gemini conjunct the Donald’s Sun and opposition his Moon so a control-dominate relationship; and Pa’s rigid Saturn in Aquarius opposed Donald’s Mars, indicating harshness and lack of sympathy. Not too dissimilar to Putin’s crossovers, see previous post. 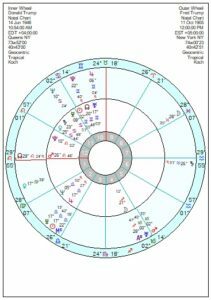 Fred Trump had a bleak, emotionally chilly chart with an Air Grand Trine of Sun Saturn Pluto; plus an explosive Mars Uranus in Capricorn opposition Neptune. And oddly enough Melania is just like his stalwart Scottish mother Mary – a Sun Saturn in Taurus. As to when Donald Trump will run into the buffers? I always reckoned if his explosive Solar Arc Uranus conjunct Mars (in place this summer and for a few months ahead) didn’t get him, 2019 would. He looks disappointed this November and December as tr Neptune opposes his Jupiter/Pluto midpoint. Ebertin describes this as: cheating and suffering damage without being aware of it. 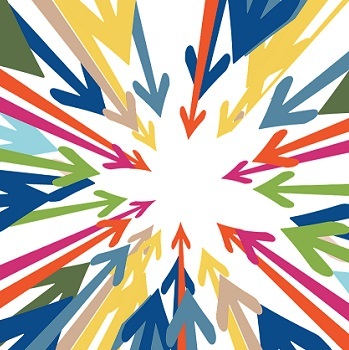 Where the real aggro kicks in is from mid February 2019 onwards with a run of enraged, trapped and scary Pluto hard aspects to his Mars/Uranus and then his Mars/Saturn as well as opposing his Saturn – those run on and off till late 2020. That is a punishing amount of pressure, which he’ll try to brass-neck his way out of initially but it’ll keep on coming. 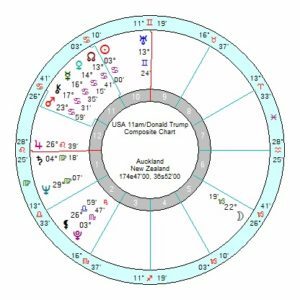 His relationship chart with the USA also shows April 2019 as the start of a two year run of the country losing its rag with him (perhaps before depending on the Moon’s position). 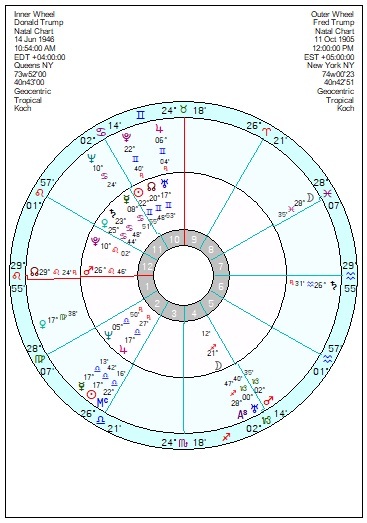 His Solar Return from June 2019 for the year thereafter is brutally suppressive with Saturn Pluto in the 10th opposition Mars in the 4th as the driving rod of a Water Grand Trine of Mars to Neptune to Moon. Plus a head-in-the-clouds, ever-optimistic Sun opposition Jupiter square Neptune. Nothing is certain and he’s been through meltdown phases in his life before and shamelessly hauled himself out of the murk. But he’s in his 70s living a very unfit lifestyle with less energy. The one name Putin brought up unprompted was Bill Browder, the investment banker whose campaigning against Russian corruption brought in the Magnitsky Act which has frozen oligarch (and probably Putin’s) assets abroad. See older posts below. And the FBI/US Attorney’s office (not Mueller) have charged a Russian woman, Maria Butina, with spying for Moscow by “infiltrating organisations having influence in American politics, for the purpose of advancing the interests of the Russian Federation”. It’s though the organisation referred to is the National Rifle Association (NRA). She’s on a run of swampy, uncertain and confidence-eroding Neptune transits till late 2019; with a few ups but generally into catastrophe time from January 2019 till the year end and worsening in 2020/2021. The NRA are facing setbacks this year with tr Saturn conjunct their Saturn Mars and square their Venus; and in a total muddle in 2018/2019 with tr Pluto square Neptune which can be scandal-prone. BILL BROWDER Post March 10 2018 The Skripal attempted assassinations have brought the Sergei Magnitsky affair back into the headlines, as well as Deutsche Bank money-laundering suspect Russian funds into the New York property market, which may impact on the Mueller Investigation. His former employer financier Bill Browder is still fighting his corner, relentlessly lobbying governments to sanction corrupt Russians laundering their money in the West. His book Red Notice: How I Became Putin’s Number 1 Enemy is being made into a film – Amal Clooney is his lawyer. His Magnitsky Act, intended to impose visa sanctions and asset freezes on corrupt officials, has now been introduced in seven countries including Britain, the US and Canada. As a result he lives in a “warzone”, receiving numerous death threats: text messages and voicemails from unregistered Moscow numbers. A few years ago the Russian prime minister Dmitry Medvedev told reporters in a briefing: ‘it is a shame Sergei Magnitsky is dead and Bill Browder is still alive and running around’. In 2015, he says, US intelligence authorities alerted him to an illegal rendition plot being formulated against him. Browder, born 23 April 1964 Chicago, Illinois, is a Sun, Jupiter, Mercury in Taurus trine Uranus Pluto in Virgo – suited to a money business, stubborn, rebellious, not one to budge easily; especially with Saturn in Pisces opposing his Uranus Pluto. His Mars in pro-active Aries is under assault from a tr Pluto square, 2017/18, finishing this September/October, which is not only frustrating but also high-risk. His relationship chart with Putin is stressed and aggravated with a Yod of Mars sextile Saturn inconjunct Sun. And it will be under extraordinary pressure in 2018/19 with tr Pluto square the composite Sun. Browder’s Mars opposes Putin’s Saturn Neptune in Libra and squares Putin’s Uranus – so he will be a thorn in Putin’s flesh. Despite Putin being a walkover for this election he does not look remotely happy or clear headed with tr Pluto moving to square his Neptune from late March till late 2019 – which tends to be devastating and scandal-prone. The Labour MP Yvette Cooper, chairwoman of the home affairs select committee has pressed this week for police to reopen investigations into 14 suspicious deaths in Britain linked to Russia in recent years. This would include Russian financier Alexander Perepilichnyy, who died while jogging in the UK in 2012, after handing information to Browder’s firm with information on the people behind Magnitsky’s murder. Despite US intelligence agencies saying there was Russian involvement in his death, the Surrey Police ruled out murder. The drip drip of toxic info keeps coming about the Trump dynasty’s Russia connection. This is just background about one, now deceased, piece of a jigsaw that is slowly coming together, involving Russian money-laundering through the New York property market and through the German Deustche Bank, already under investigation for same, whom certain Trumps had significant dealings with and loans therefrom. Sergei Magnitsky was a Russian lawyer/accountant, arrested after accusing Russian officials of tax fraud. He died a year later in custody after beatings in 2009. As a result of his death, the Magnitsky Act came into being which put banking restrictions on Russian officials implicated in human rights abuses. It’s those sanctions which Putin is keen/desperate to get lifted. The lawyer involved in last year’s meet with Don Jnr and Jared Kushner is heavily involved with the main players in the above. Magnitsky, born 8 April 1972 in Odessa, Ukraine, was an Aries Sun in a rebellious/activist opposition to Uranus. He also had a communicative Air Grand Trine of Pluto trine Saturn Venus Mars trine North Node (Moon) in Aquarius with Pluto opposition Mercury – so a crusader (NNode in Aquarius), gutsy with Pluto Saturn Mars, though maybe not too practical. He also had Neptune opposition Saturn Mars Venus which formed the boundary of his Half Grand Sextile – idealistic, slightly fanatical or head in the clouds, but talented. When he died tr Neptune was squaring his Solar Arc Uranus opposition Sun; tr Saturn was just over the conjunction to his Pluto and trine his North Node. His reforming Uranus was conjunct Vladimir Putin’s rigid authoritarian Saturn (Sun Neptune) with Magnitsky’s Saturn Venus Mars falling in Putin’s secret 8th conjunct his Gemini Moon so arousing anger. This year the Magnitsky family lawyer fell/was pushed from a 4th storey window and seriously injured. Add on: As ever with any story involving Russia, high finance and money-laundering the waters get exceeding muddy. There are however incontrovertible facts. Magnitsky was beaten in prison, denied medical treatment and died. Russian money-laundering through US and indeed UK property deals is an accepted fact. Deutsche Bank in May 2017 agreed to pay $41 million to settle Federal Reserve allegations that its U.S. operations failed to maintain adequate protections against money laundering, the latest in a string of fines that have cost the German lender billions of dollars. Deutsche Bank has recently reached settlements with the U.K. and New York State’s Department of Financial Services over trades that allegedly helped wealthy Russiansmove some $10 billion out of the country. Trump says he’s inviting Putin to the White House this fall. What’s next, a state dinner in his honor? Yes, followed by a military parade of such greatness. All americans love a parade. But it won’t be a real parade…just one of Lego toys. I’m still standing behind the theory that at some point Putin will deem Trump just too unpredictable and ditch him. He wants Russian sanctions lifted, but this does require a Congressional approval. And there have been a couple of things after Helsinki that have outraged too many Republicans too for Trump’s call never to pass. I’d say this is the February 2019 Crisis. Possibly. Putin is having the time of his life with playing Trump as a marionette. Trump doesn’t know what’s coming next. FWIW, Putin’s game (in conjunction with Red China) is to create such rifts and tensions within the American intelligenec and economic communities to eventually walk (and sail) where they will. Of course he’s back tracking and lying. He has a doctorate in the subject. He slammed The Sun for running an interview in which he criticized Theresa May and said they were lying and printing ‘fake news’. They in turn said Trump lied and that he did say those things. He then hit back saying “you need audio proof to say I said those things otherwise it’s the usual fake news,” and The Sun turned round and said, “okay, here’s the audio recordings” and proved beyond doubt he did say those things! He just shrugged it off and ignored it all before steamrolling into the next debacle. I imagine his fans would just pretend that ‘lying Trump’ never happened just like he has turned his back on being accountable about the interview? Honestly, the guy is absolute cuckoo! The sudden black-out while Trump was back-tracking to the media was surreal. Apparently John Kelly was the culprit as he accidentally leaned back against a light switch! ‘Would’ and ‘Wouldn’t’, ok. Then what stopped him from correcting himself at that moment? Well, trumptards are buying it. This scenario is straight out of “The Manchurian Candidate”. Dear Marjorie. Interesting, as always, but please take note that Maria Butina is 10 years older. She was born in 1988.
maybe the next time they meet, they could give a shout out to(or the media can invoke the name) marina Popovich! Trump now claims he “misspoke” at the Helsinki summit. This is the closest we’ll live to see an actual admission of an error. He said “would” instead of “wouldn’t” apparently. Damn that pesky English language! When it comes to excuses, this plumbs new depths of lameness. Let’s try Russian or…Ukrainian ! That would trigger some comradely good gossip. This reads like a John le Carré novel.